A year after their 509 pistol series hit the market, FN this week announced the line has grown to include a new Midsize offering and a black Tactical model. The 509, essentially an upgraded and enhanced FNS designed for military use as a competitor to the Army’s Modular Handgun System contract, was released last year to an eager market. Chris Cole, Vice President of Sales and Marketing for FN America, said the two new variants to the striker-fired pistol line will help better meet the varied needs of discerning handgun shoppers. The Midsize, which retails for $649, has the same 4-inch barrel as the standard 509 but features a frame with a shortened grip. 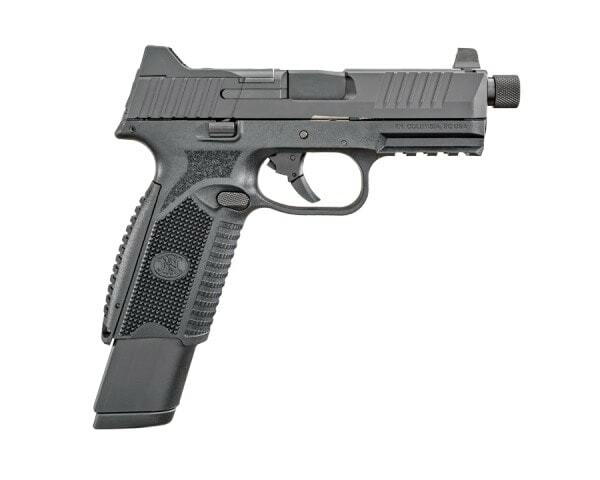 While the chopped-down offering uses 15- or 10-round magazines (depending on state restrictions) it is backwardly compatible with the standard FN 509 17- and 24-rounders through the use of a grip sleeve. It comes complete with fixed three-dot luminescent sights. For those who wanted an FN Tactical 509 in a factory finish other than FDE, how about the always-popular black? The black version of the 509 Tactical has all the same features as that pistol– an optics-ready mounting system with co-witnessing suppressor-height night sights, 4.5-inch threaded barrel, 24-round mags– but with a matte black finish rather than the standard FDE. Retail is $1,049. The post FN expands 509 line with Midsize, black models appeared first on Guns.com.